This multi-part series explores the background behind the establishment of the Women’s Health Initiative (WHI) and the major findings for women’s health on the benefits of various interventions. Part I addresses the WHI’s background, and explores the study’s findings on low fat diets. Part II addresses what we’ve learned from the WHI about hormone therapy and calcium/vitamin D supplements. In the early 1990s, the number of women with breast cancer was rising quickly as the baby boomers entered their 40s and early 50s (when the risk of breast cancer increases dramatically). Women all over the country tried to make a political analysis of their own personal experience, and a movement sparked into life. For many breast cancer activists in those years, the big question was how to prevent the disease. At the same time, NWHN leaders had become intrigued with the dietary fat hypothesis, which held that high fat diets changed the way the body metabolized estrogen and produced types of estrogen that increased the risk of developing breast cancer. (These visionaries included Susan Rennie and Rose Kushner, who co-chaired our breast cancer committee in the 1980s.) Many felt that the dietary fat hypothesis offered the best potential to help prevent breast cancer. Concurrently, promoters of hormones for post-menopausal woman were revving up to go way, way beyond the data. Hormone therapy had been found to be effective treatment for menopausal symptoms (such as hot flashes or vaginal dryness), but physicians started to promote hormones to all post-menopausal women to prevent diseases such as heart disease and Alzheimer’s. 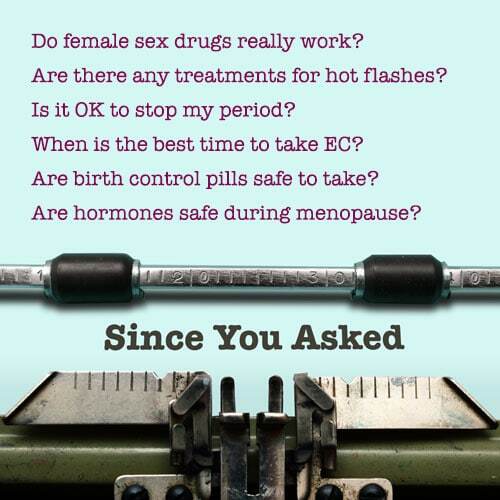 Drug companies and supportive physicians told women that hormone treatment was actually hormone replacement therapy (HRT) that would help maintain the health and vigor of women’s younger years, when their hormone levels had been higher. HRT use had already grown beyond what we, at the NWHN, believed was safe, and many women were taking HRT to prevent fractures based on just so-so data of its effectiveness. At the same time, very worrisome, if inconclusive, data were starting to emerge about HRT’s risks, including breast cancer and blood clots. Women’s health advocates fought hard to keep the Food and Drug Administration (FDA) from approving HRT for heart disease in healthy women in 1990 (in fact, the FDA’s Advisory Committee recommended approval). And that victory only stopped the FDA’s formal approval; it didn’t put a dent in the marketing campaign promoting HRT’s broader use. We knew that a large, long randomized trial was the only way women would ever know HRT’s real effects. While there was excitement in the women’s health community about exploring ways to prevent breast cancer and enhance women’s health, no one would do these studies. No single company profits from the benefits of a low fat diet, and none of the many companies that made lots of money selling low fat products was willing to do a long-term study on breast cancer prevention. Wyeth Ayerst, the company that profited hugely from selling HRT (as the manufacturer of Premarin and Prempro, Wyeth had 80 percent of the U.S. market), steadfastly refused to conduct the type of trial required, either. And then our moment came — through political savvy, good coalition-building, and other factors that included just plain good luck. Women’s health advocates got a chance to force the government to study the questions we most wanted answered. It didn’t come easily, though. Congress said it would cost too much. Some researchers said it just wasn’t possible to recruit such a large number of older women and engage them for many years. Other researchers said it would take too much money away from their research. And, many gynecologists said that whether or not the study could be done, it shouldn’t be done, because it was unethical to randomize women to placebo and deny them HRTs ‘proven’ benefits. But we persisted, and when Dr. Bernadine Healy became the first female director of the National Institutes of Health (NIH), she announced that NIH would begin a comprehensive study of older women’s health. The resulting “Women’s Health Initiative” began recruiting volunteers in 1993, eventually enrolling 161,808 women, nearly 20 percent of whom are women of color. The WHI included a large observational study and three randomized trials testing the effects of HRT, low fat diet, and calcium/vitamin D supplements. As the results have been announced, we’ve realized that the WHI made history. Now we know that hormone therapy doesn’t help women age more healthfully, and that HRT is more about marketing than science. The WHI hasn’t answered all of our questions, but it has given us a tremendous amount of helpful information – truly a legacy for future generations. Low fat diet: You are what you eat…Or not? The WHI dietary fat intervention results were released earlier this year and stirred up a lot of controversy due to the research’s unexpected findings. The WHI indicated that a low fat diet — which many had hoped would be a safe and effective way to reduce the risk of breast cancer — failed to show a significant protective effect. Although women eating a low fat diet experienced fewer cases of breast cancer compared with women who followed general guidelines for good nutrition, the difference wasn’t very large and it could have occurred by chance. Breast cancer occurred at a rate of 42 cases per 10,000 women per year in women eating a low fat diet. By comparison, the rate was 45 cases per 10,000 women in those not following the low fat diet. But, when you look more closely at the data, it seems the low fat diet might have had an effect, at least for some women. It’s not very reliable, however, to ignore the overall results of a well-conducted trial and claim that results in a sub-group are conclusive. The NWHN is following this debate closely and will continue to weigh in on the findings. In general, however, we believe women should decide for themselves what they think about the WHI dietary modification trial and its effect on breast cancer. The NIH cut off the trial after 8.1 years, even though it needed 9 years for enough cases of breast cancer to have occurred in the study group. If the trial had continued, the observed reduction in cases might have continued and become definitive. Women who started the trial with the highest-fat diets experienced a significant reduction in their risk of breast cancer. The low fat diet reduced the risk of certain kinds of breast cancers: those fed by estrogen rather than progesterone. The participants weren’t able to stick to the diet, which called for them to eat just 20 percent of their daily calories from fats. Women averaged 24 percent of calories from fat after one year in the study, and higher percentages as the study continued. The same diet, tested in women who have already been treated for breast cancer, has been found to reduce the risk developing new breast cancer. It may be that women with breast cancer are more motivated to stick to a very low fat diet. Or, maybe it’s easier to see the effect in a group of women who were more likely to experience the disease. The trial included 48,000 women and followed them for eight years. The trial leaders are the leading proponents of the theory that low fat diet protects against breast cancer; the trial was not undermined by weak commitment on the researchers’ part. If an effect wasn’t found in a trial this big, this long, and this good, then it either doesn’t exist or is so weak that it’s not an effective intervention. Maybe it’s not total fat, but the kind of fat that makes a difference. This has been demonstrated for heart disease; heart-healthy diets now emphasize reducing saturated fats and trans fats, and including a reasonable amount of healthy fats such as olive and fish oils. It may be that what’s important is what’s in the fat. Certain kinds of environmental toxins concentrate in fat, and high fat diets are known to increase exposure to things like dioxin, DDT and PCBs. This hasn’t been proven, but is a leading hypothesis currently under study by environmental health researchers. One aspect of the dietary modification trial was not controversial. The low fat diet had no effect on heart attacks or other types of cardiovascular disease. The NWHN agrees with the advice given by the WHI researchers when these results were announced: a heart-healthy diet should be low in salt, saturated fats, and trans fats; it should be high in whole grains and fresh fruits and vegetables.